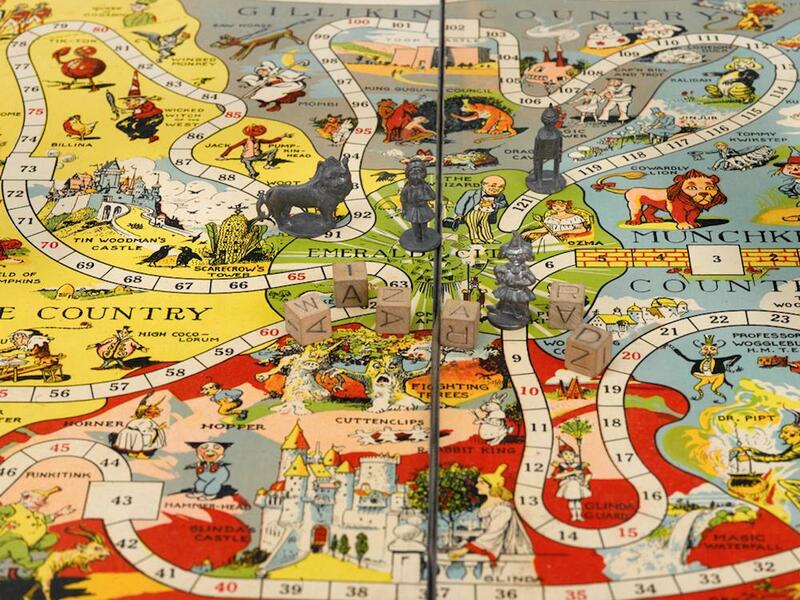 Wizard of Oz: Story-based board game sold in the 1920s. 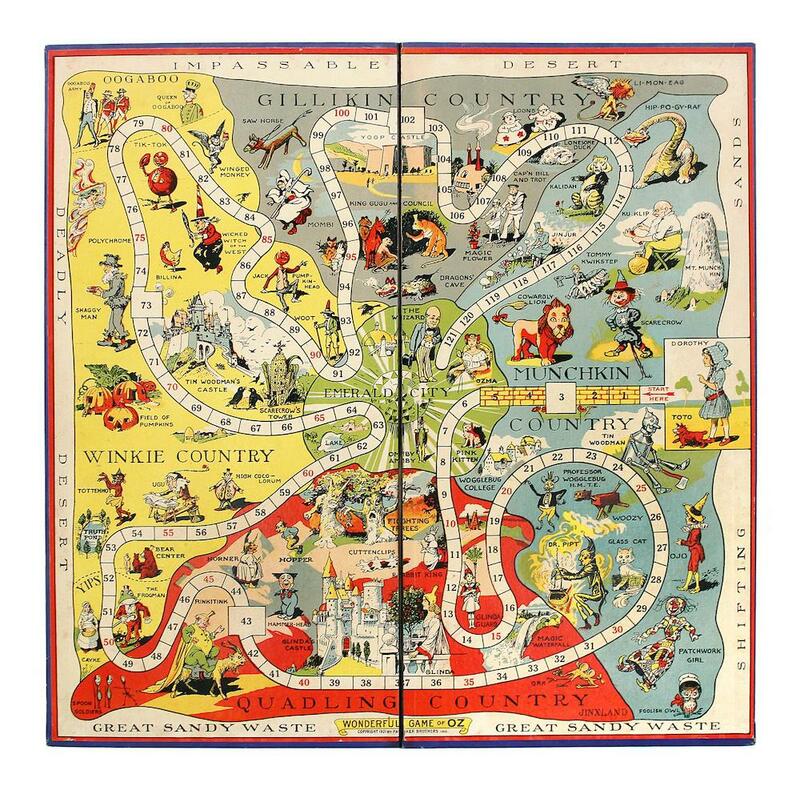 Pictured below are the game board, tokens and dice, and box top of the first Wizard of Oz board game, sold by Parker Bros. in 1921. 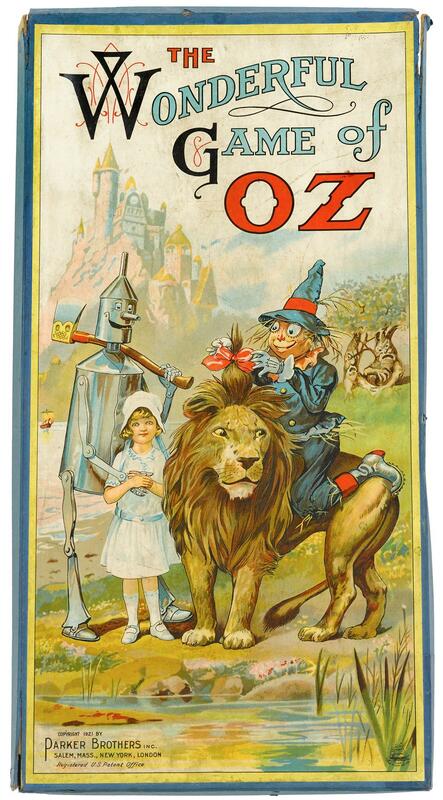 L. Frank Baum published 14 Oz books between 1900 and 1920. Well before the classic 1939 movie came out, the books spawned many theatrical adaptations, as well as saga-themed objects like dolls, figurines, and this board game. Many of the characters and places scattered around the 1921 board will be unfamiliar to people who know the Oz story from the 1939 movie or the original book (by far the most famous of the series). The presence of Woot and Ugu shows how familiar the whole Oz series would have been to the game’s audience. A group of Oz fans played the game at Winkie Con (Oz Con International) in 2011. Happily, one of them took pictures of the pages of the instruction booklet, so I can report that the gameplay is fairly straightforward. The unusually marked set of dice features the letters in the word “WIZARD” in lieu of numbers. Players roll the dice and see how many letters of “WIZARD” they can turn up (so, if you roll a “WIZZAA,” you move four spaces). Red-numbered spaces give you a forward bump. The first to reach the Wizard on space 121, and to roll the correct combination of dice to be let “in” to the Emerald City, wins. Parker Brothers rereleased this game, with wooden playing pieces instead of pewter ones, after the 1939 film became a hit. An edition of the 1921 game will go up for auction in Philadelphia on April 10. Click on image to reach a zoomable version.